Just like his nickname would lead you to believe, Shayne Gostisbehere was nowhere to be found. When the Philadelphia Flyers took the ice on Tuesday morning at Skate Zone in Voorhees, everyone was present and accounted for except for the Calder candidate with great stats (46 points in 64 games) that still underrate his impact on the team. Turns out, it was a maintenance day for “Ghost.” When Dave Hakstol was asked whether he was concerned by Gostisibehere’s absence — The 23-year-old rookie did log 21 minutes of ice time in Sunday’s meaningless win over the Islanders — he was succinct. Even with his absence at practice, Gostisbehere should prove to be a key figure in a crucial element of the series with the No. 1 Washington Capitals: the special teams battle between the Flyers’ power play (18.9%, 11th) and the Caps’ penalty kill (85.1%, 3rd). One way that the Orange and Black can keep up with the second-highest scoring team in the NHL is by doing serious damage with the man advantage, something they absolutely posses the firepower to do. Like a three-point sniper in basketball, Gostisbehere (8 PPG) has a certain gravity to him on the power play with his ability to shoot the puck from the point both hard and accurately. That can open some things up for some very capable teammates on the first power-play unit. Coming into the series against Washington, the Flyers’ top power-play unit struggled over the past week, going 0-for-13 with the man advantage before Sunday’s game that both Simmonds and Claude Giroux didn’t play in. The flip will have to be switched. As the season went along, teams started to make adjustments with how Gostisbehere and Claude Giroux worked on the power play. Even with some film study, the Flyers might not exactly know what is coming their way at the beginning of the series. One of the players that the Flyers badly need to get going is Jake Voracek, who saw his goal total on the power play drop from 11 in 2014-15 to just one this year. 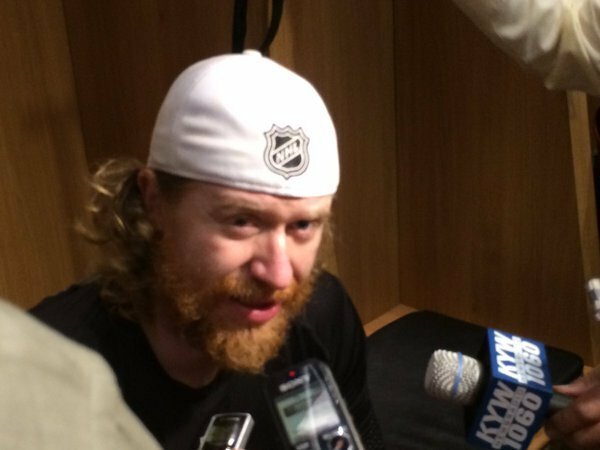 Voracek had terrible shooting luck early in the season, and he also dealt with injuries as we have moved along. Jake's beard is already pretty gross. Voracek, whose hands and timing have looked rusty at times since missing nine games with a foot injury in March, said there is no reason for both he and the power play not to produce against the Caps. Simmonds couldn’t lie when he was asked if it was difficult to refocus, one day after the only man who owned the Philadelphia Flyers passed away. The Flyers were glad to get back to work, but that won’t remove any of Monday’s emotions. They are planning to wear a patch on their uniforms honoring Snider in the playoffs. “That certainly doesn’t change anybody's feelings or emotions on a tough day yesterday,” Hakstol said of the practice. Sounds like front runners for Frozen Four MOP Drake Caggiula are (in no order): CHI, EDM, PHI, VAN and OTT. I think BUF is in the mix, too. What does Drake Caggiula (51 points in 39 games) already have in common with the Flyers? He’s at the University of North Dakota, where he spent his first three years playing for Dave Hakstol.